In 1863, a Persian nobleman named “Bahá’u’lláh,” the Glory of God, announced that he was the latest in a line of Manifestations of God that includes Abraham, Moses, Buddha, Jesus, and Muhammad. 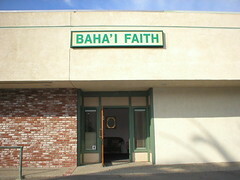 His followers were called Bahá’ís and the religion he founded is known as the Bahá’í Faith. Thirty years after its inception in Persia (present day Iran), the Bahá’í Faith reached the shores of America by way of a Syrian Christian who converted to the Bahá’í Faith in Egypt. By 1900 the Faith was established in several localities in the United States including Illinois, Wisconsin, and New York, and in the next few decades it spread to California and into the Oceanside area. The Oceanside Bahá’ís initially met in homes and continued to hold Feast and Holy Day celebrations in that manner until they outgrew even the largest living rooms five years ago. Now they rent a building downtown. The Bahá’í Center is at once in the heart of downtown and tucked away in an obscure corner. Located just minutes from the beach at the intersection of the main drag and a perpetually dark side street, the center is easy to find but hard to see until you actually arrive. It is part of an office building that lies a full story below the road level, operating much like a sunken living room with respect to the rest of downtown. The Bahá’ís of Oceanside decided to rent this property in 1996 because of its central location and generous parking lot. Anyone visiting the Oceanside Bahá’í Center would immediately find him or herself in a small receiving area flanked by a loveseat and chairs. A guest book sits on a podium in the far corner. Proceeding to his left, the visitor would encounter the lending library, where Bahá’ís and non-Bahá’ís may check out Bahá’í related books for a month at a time. 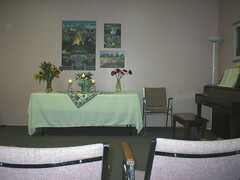 The room adjacent to the library serves as the office and beyond that lies the main activity room, an all purpose meeting area with a piano, stereo, coffee tables, candles, and a stack of flyers for upcoming events at the center. Large framed photos of the series of statuesque buildings that comprise the Bahá’í World Center in Haifa, Israel span the walls and lend an elegant air to what, aside from a strategically placed candelabra, is a room that tends toward cozy more than anything. Down the hall to his right, the visitor would find bulletin boards displaying photos of recent events at the center, advertisements for Bahá’í activities in surrounding communities, and newspaper articles written about local Bahá’í-sponsored community projects. Kitchen and bathroom facilities occupy a corner in this area as well. The hall leads to a long, narrow room that can house either a fair amount of children during children’s classes and meetings or a few children and a large buffet table when food is being served. (Food is almost always being served. The children have learned to work around the table.) The final room is stocked with free Bahá’í literature, mostly in the form of pamphlets. 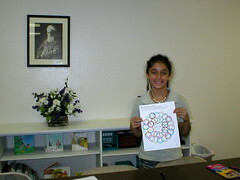 The Oceanside Bahá’í community is mostly Caucasian, although there is a significant Persian population. All meetings at the center are currently conducted in English but at any given gathering one finds individuals saying prayers in different languages, chanting in Farsi, and singing songs from around the world. Bahá’ís from the surrounding communities of Fallbrook, Vista, Carlsbad, Encinitis, and Solana Beach occasionally use the center, but residents of Oceanside are the primary clientele.